PV Management: Devising and organizing effective operations for ensuring safe and appropriate use of medicinal products. This three day-course was conducted to leverage the Pharmacovigilance expertise of ISoP and designed for interdisciplinary groups to learn and work together in order to enhance patient safety when medicines are used. The course started with one day session and an interactive workshop devoted to the understanding of basic organizational management, and resolving some of the usually not discussed aspects of managing people within therapeutic committees, PV centers, regulators, industry units handling PV concerns, funding, communicating with superiors and funders of PV work. On day 2, there was a half-day session on the statistical and epidemiological tools that assist the PV practitioners to understand and make decisions on risk-benefit judgment. Various perspectives from regulators, industry, clinicians, and committee decision makers were also studied. Then, the recognition of the medical manifestations of Adverse Drug Events was studied in the afternoon, taking into account the perspectives of specialists who sees these drug induced conditions by way of referrals, and how to manage these conditions, how to communicate with patients. Patients were invited in a guided focus group discussion to obtain a reality of how they cope with ADEs and how they can contribute to global reporting. The last day was devoted to the study of using laboratory to support ADR investigations, and how hospital laboratory results as gleamed from patient charts can be used for research and early identification of life-threatening ADRs. There was also a session on new trends in education and training of PV in health professional schools. At the end of the course, the participants were expected to appreciate the complexities of pharmacovigilance and be able to better use appropriate tools to advance better detection, monitoring, reporting and prevention. Risk management was another important course content that will align regulators and industry to promote product safety. Hands- on interactive tasks, panel discussions and lectures were the main instructional approaches. Please click here to download PDF (Final programme). 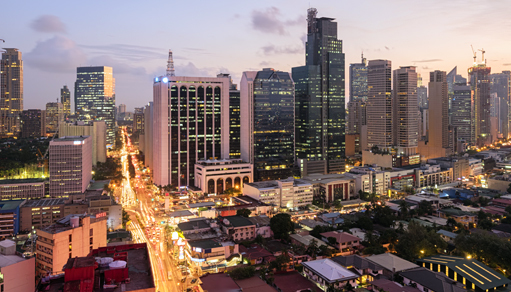 It’s address at the heart of Makati Central Business District is only a 5-minute walk to major shopping centers. Wifi is available at the AIM venue. In April, the weather is between 29-33 degree Centigrade. Indoors in the caseroom can be chilly due to air conditioning (22 degree Centigrade or so). Dress code: business casual will do. The school generally suggests no shorts, sandals while in the classrooms. The Philippines is a Southeast Asian country in the Western Pacific. The Philippines archipelago comprises 7,107 colourful islands. The local currency in the Philippines is the Philippine peso.